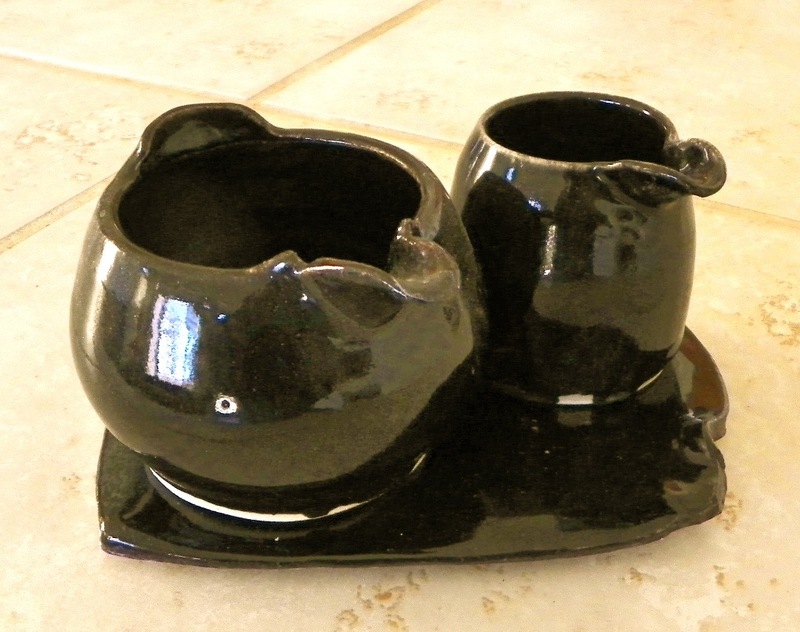 A bit of my own amusement.......two little hand-held pitchers on a tile base. I don't know what they're for. Maybe two kinds of salad dressing. Maybe cream and sugar. Sure, you can pour sugar. We do it at resturants without batting an eye. Maybe two kinds of gravy. Or sauce. Chocolate or carmel? Maybe both. 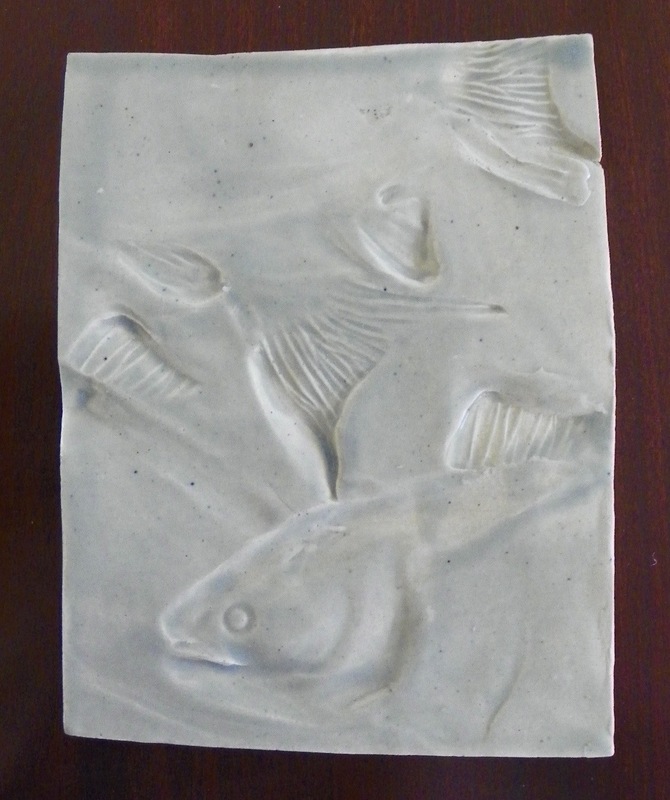 The tile base is free form and has a little curled lip---just for fun. 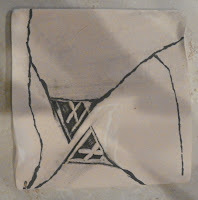 I'm trying some underglaze and stamped designs on a few tiles made of porcelain. 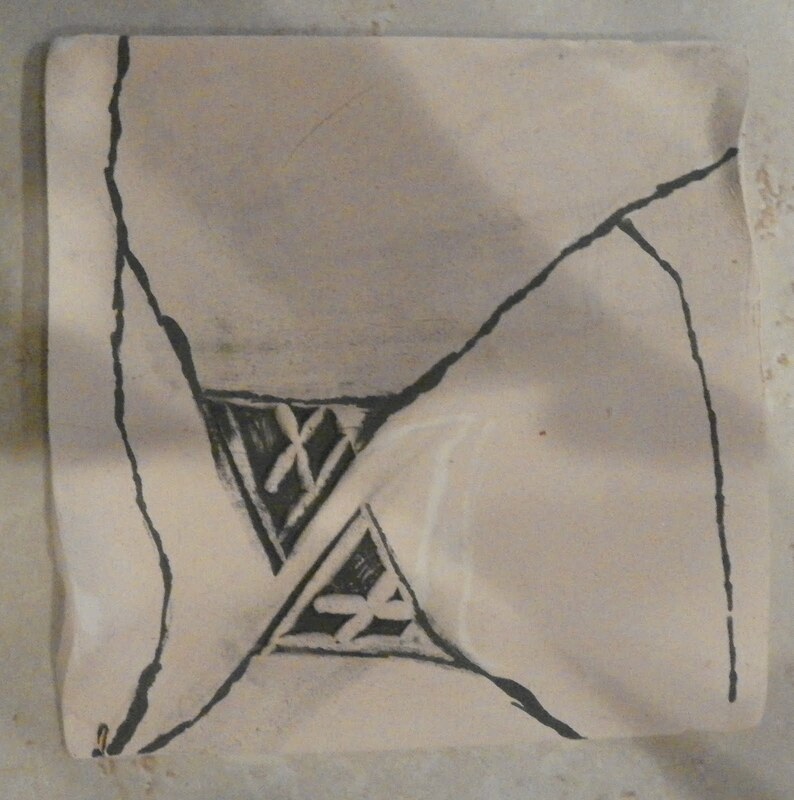 I have no idea if the black will even register, but thought it would be interesting to see what would happen using a stamped figure and a light underglaze over the design. 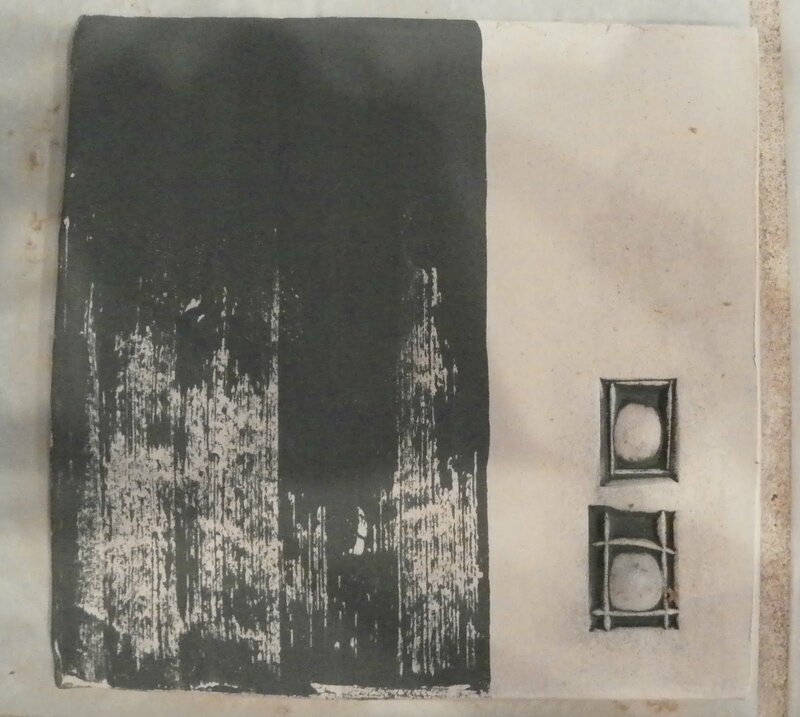 This last one is just drawing on a blank tile. 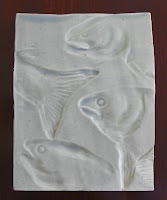 I plan to use a transparent glaze over all of them. Note: Please ignore the light shadows that are in the photos--the tiles are really quite blank-looking. I also have some small test tiles with underglaze stripes down one side and various glazes over that. Those may not work at all, but who knows? 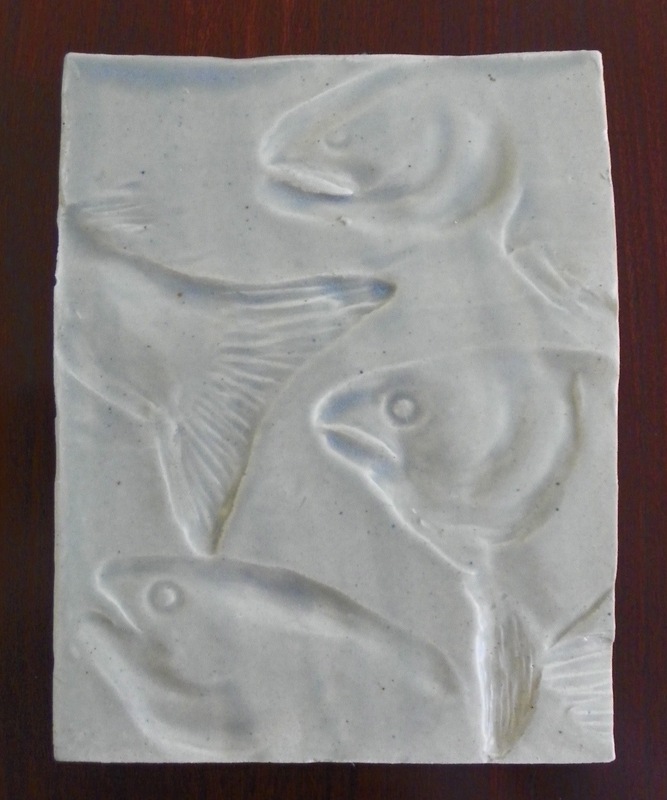 Experimental tiles done with fish impressions. 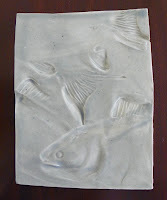 The impressions are concave, made from convex bisque molds and celadon glaze. I like the look of the celadon with the impressions. Worth pursuing in a more controlled, larger set of tiles, I think. 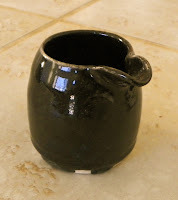 This one gives you a good overall idea of the rim--that it extends out and gently turns down. Not much is shown of the size of the inner opening but the outer and inner shape of the rim is evident, although the back inner edge is not shown well. The fact that there are two curved loops or "handles" and their relationship to each other is evident. The volume of the body is evident. An enlargement of this image shows that the front and back rims are not quite in focus--the depth of field is shallow, although the loop handles are well in focus. This image shows the sweep of one loop but says nothing about the other one except that it's there. This is a kind of "Look at my muscles" shot. The whole story is the loop. 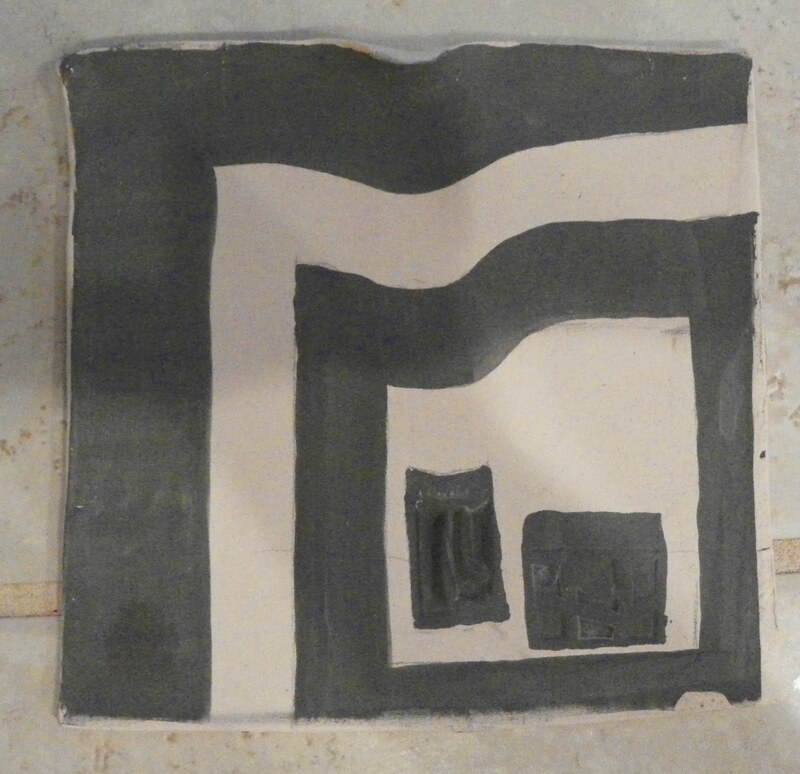 And for some reason--lighting, reaction of the glaze, weird lens response--the loop doesn't look exactly rounded. There's more definition of how the inner and outer rim are constructed, but you don't know what's going on on the other side of the pot. 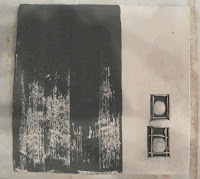 If this were going to be entered into a single-image juried show, this is not the image to send. The story of the rim is better here. You can see that it is lipped and recessed below the edge. You understand the curve of the handle and the bulk of the pot. Turning the pot picks up the rim's great glaze coloration. Show this stuff off! The sweep of the loop is better defined. 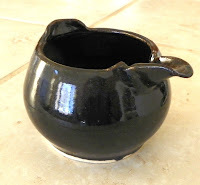 And you do get a better understanding of the bellied out body of the pot and the size of the opening. 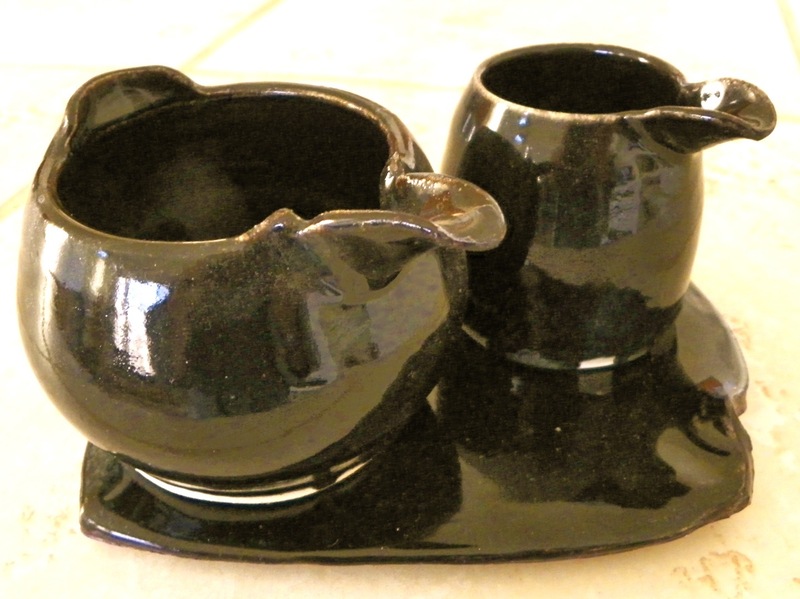 The story here is the shape of the upper lip of the rim, the width and depth of the opening and the two handle's relationship to each other. 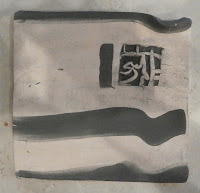 But the bottom half of the pot is obscure. You get a better idea of the coloration of the glaze on the rim. I like the blackness of the opening. This shot gives the pot a lot of weight. The lower half is in shadow, however. On the left-hand side,I don't like the top of the loop shape aligned exactly with the side of the pot behind it. This is a bit ambiguous. And the focus isn't good, although the focus at the bottom of the loop is great and shows it off well. So the story here is curvy loop, deep dark opening; rim coloration secondary, but a nice balance with the showiness of the opening. So, if you were picking slides to send to a jury, which would you choose? 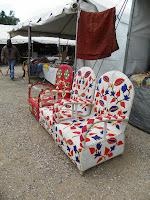 Yesterday I thought I had been to Ali Baba's cave. Just when I thought it couldn't get more boggling, I was nearly boggled to death. 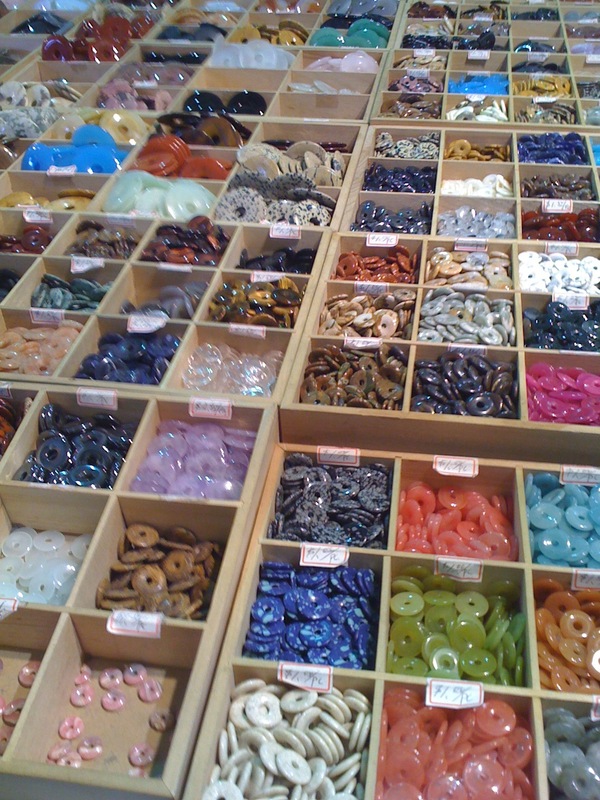 How about donuts of every kind of glass or stone? And all kinds of sizes. And all I bought yesterday was boring tools. 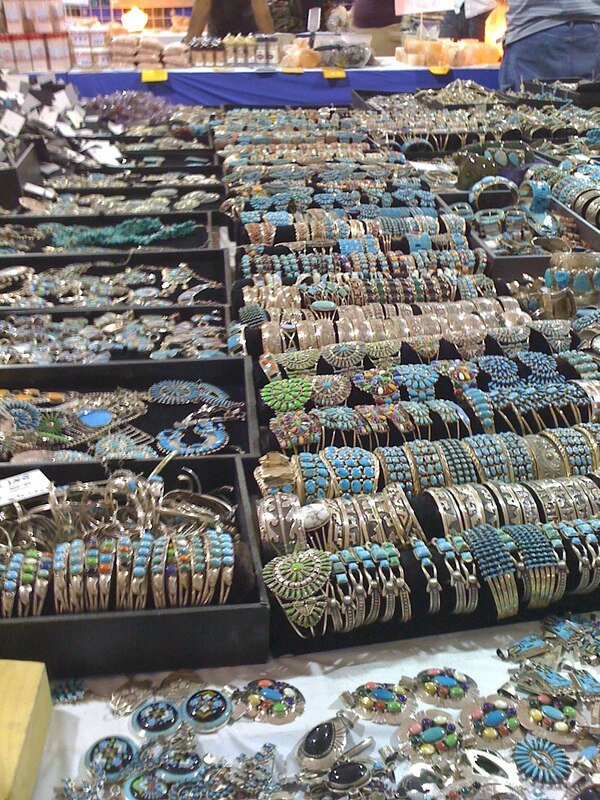 No photos, but it was a bonanza. 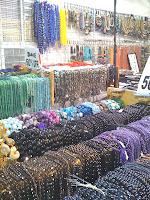 There's umpteem ga-zillion shows around town that have minerals, gems, supplies, tools, fossils and beads. 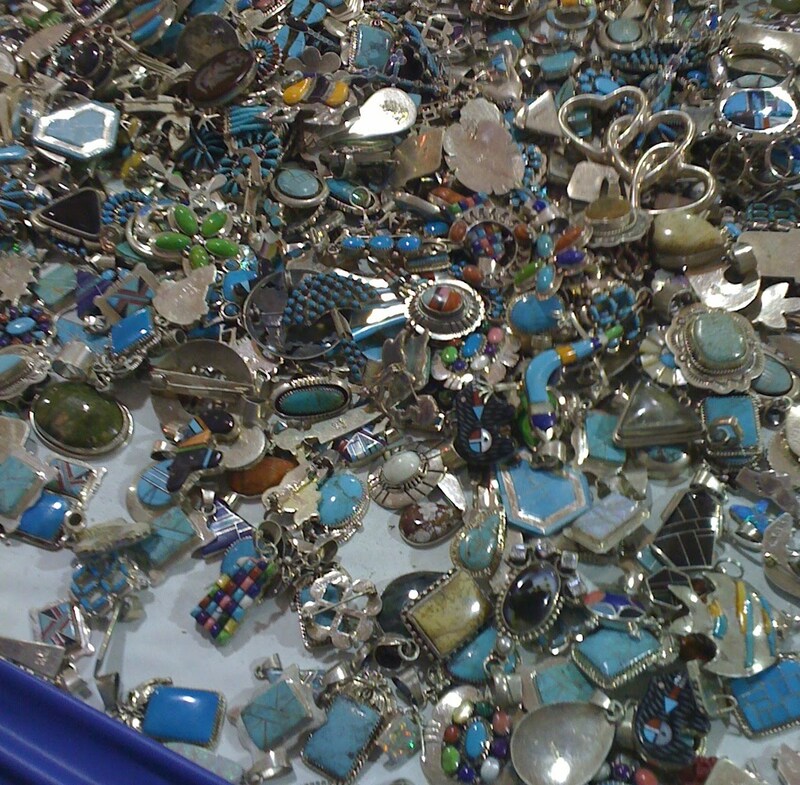 I've only concentrated on the bead shows part and I'm in total sensory overload. Here's only a small sample of the displays. 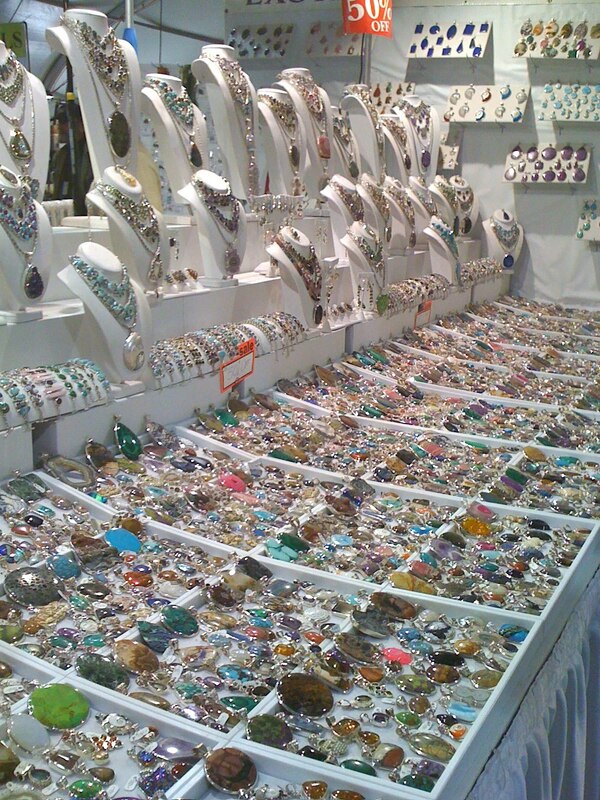 Some booths are full of bling. There must be enough crystal strings to go to the moon and back. 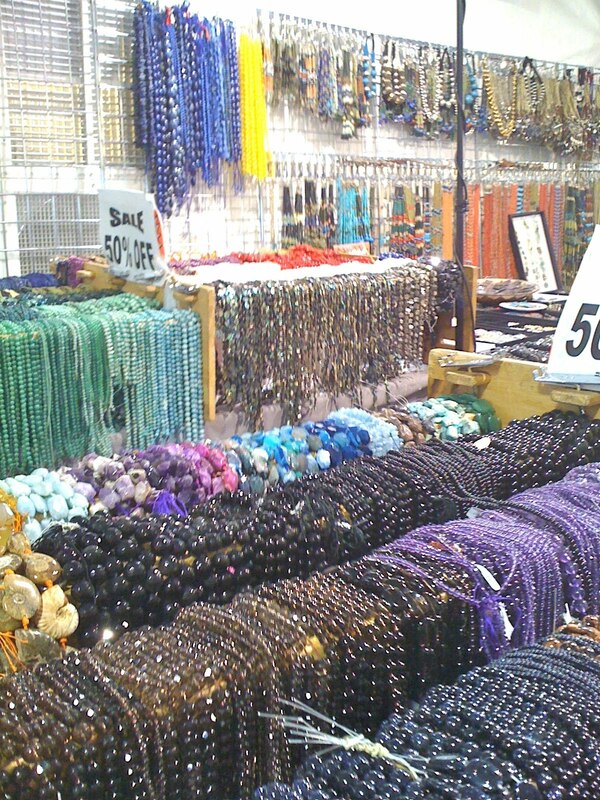 And pearls--there's barrels of pearls. Every color and shape you can imagine. But not the really good ones--the ones that have been irritating an oyster for say, three to five years. Some of these look like they were taken out last Thursday. Not for serious jewelry. Click on the photos to get the full impact. 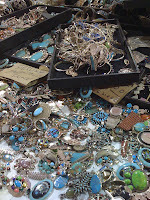 I found some intriguing colored copper wire that might work with clay as well as jewelry. That's the great thing about looking outside your own box--new materials can inspire new creativity. As a matter of fact, one vendor who stocks buttons and a special backing was telling me her supplier was not making many of these backs anymore. (I was wanting to purchase some.) So I was telling her about kiln wire and that maybe it would work for her. I got home yesterday and sent her all the info to check out. 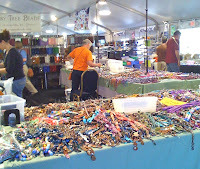 I picked up some silk wrapped bands from a most unique booth and am in the process of putting together six necklaces from that inspiration alone. I learned how to knot pearls and beads and have found some really good tutorials on the web. 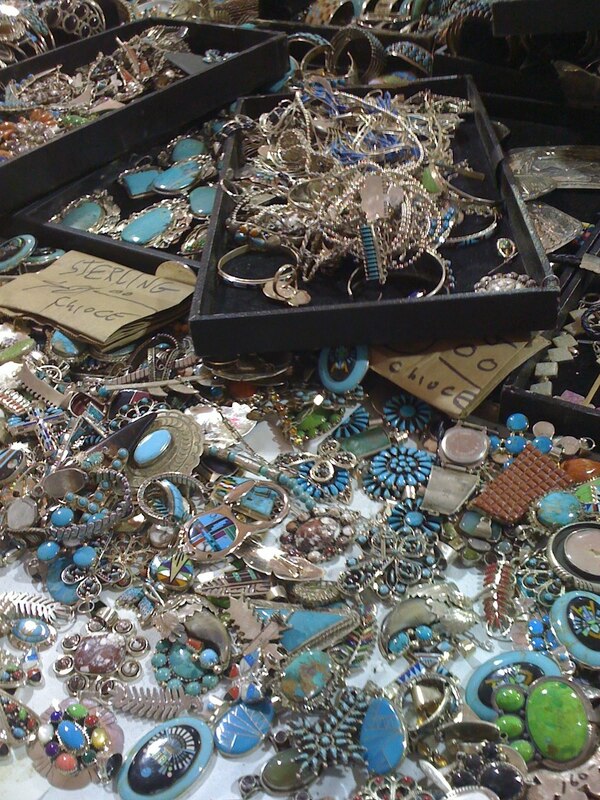 Just search for Jewelry Making and you get a huge data dump. 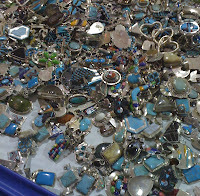 Making my own beads and pendents has definitely gone into my creative stew pot. 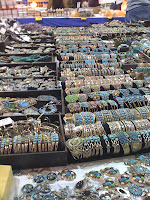 Just got back from 2 days prowling the halls of the Tucson Bead show, part of the megga Gem and Mineral Show. 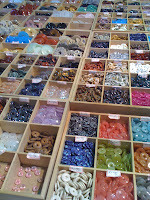 Today, I spent the day at To Bead True Blue. 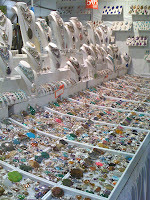 Two huge display areas showing everything from crystals to precious clay and fimo jewelry. 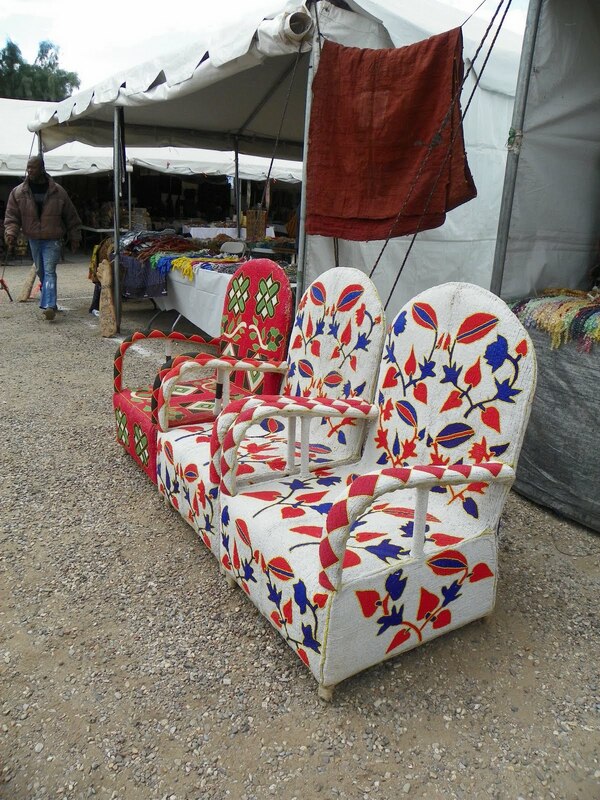 Yesterday we went to the African Village, a very large area of extended tents filled with carvings, iron works, fabrics, beads, furniture, rugs---absolutely boggling. Had to leave early because a storm blew up and all the tent-holders had to roll down all the sides and close down to keep the tents from becoming airborne. Not fun to be standing in a dancing, flapping tent with rain and wind swirling around. 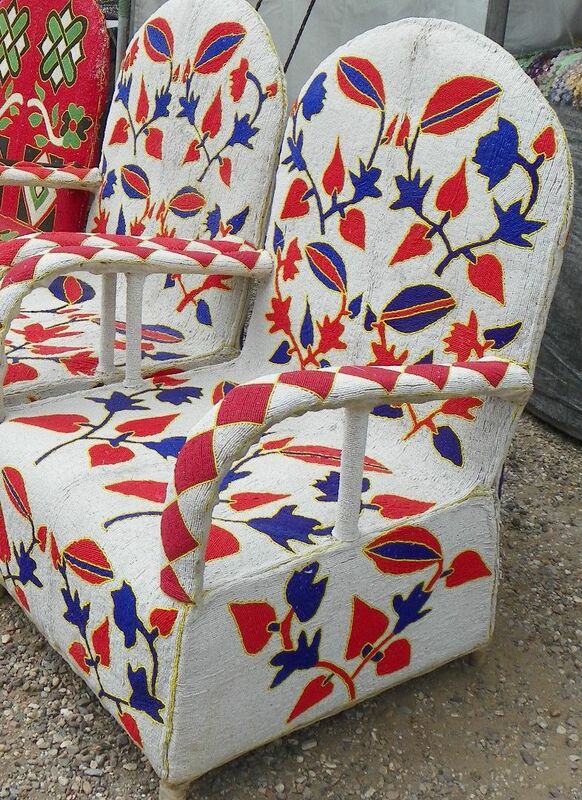 These chairs were completely covered with seed beads. 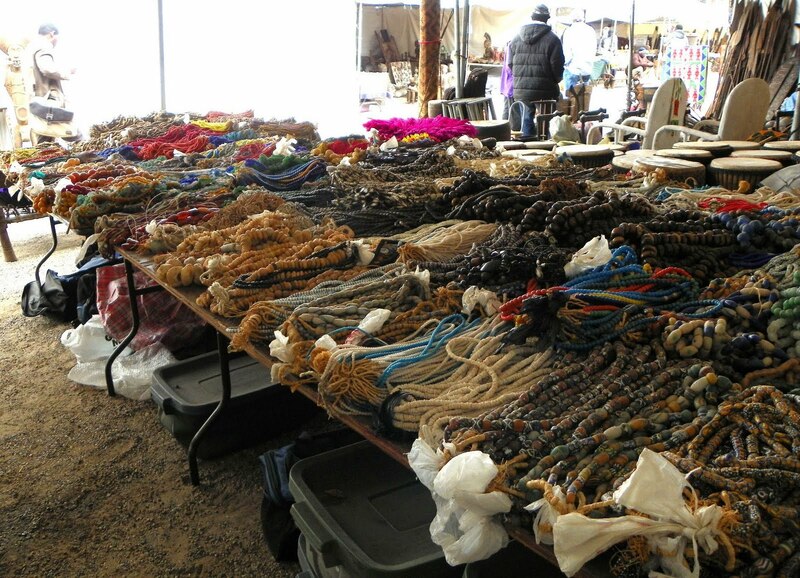 We had previously visited a tent that extended about the length of a football field showing beads, fossils, metiorites, minerals, jewelry, even stone sinktops, bowls, plates and even a desk. 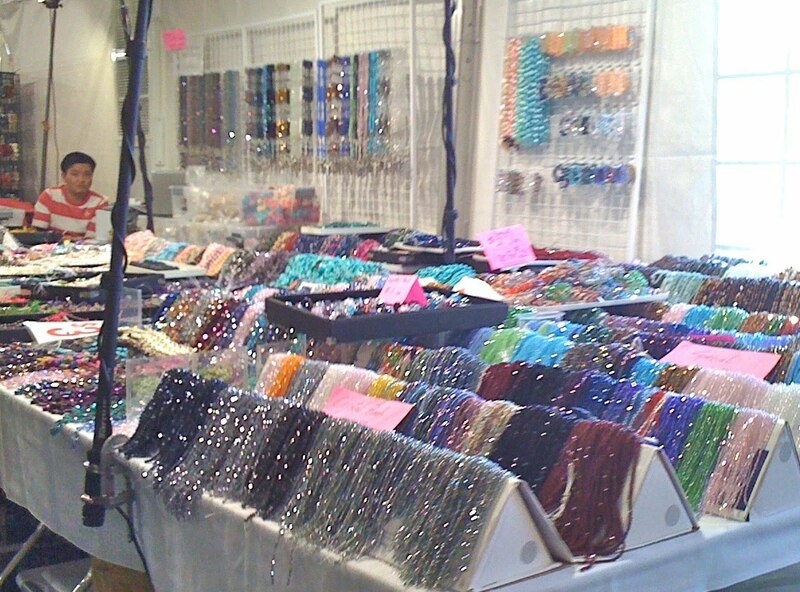 If I just concentrate only on beads, there are at least four more venues to visit during the show!!! Don't know if my budget will survive.